Imagine listening to your favorite tunes on your phone, only to have your wireless connection cut off when you leave your bedroom right at the song’s best part. Or imagine streaming that series finale you waited so long to watch, only to miss the climax because of your poor wireless connection at home. Now, imagine a world where your access point can extend the wireless coverage of your existing wireless network without missing a beat—this is the power of the DAP-1860 AC2600 Wi-Fi Range Extender, and with it, you’ll never have to lose your signal ever again. Depending on factors like solid walls, glass, interferences, or other obstacles that can degrade the signal, you can stay up to date with live news and pressing current events, or cheer for your sports team on their championship match on your mobile device without missing a single thing. 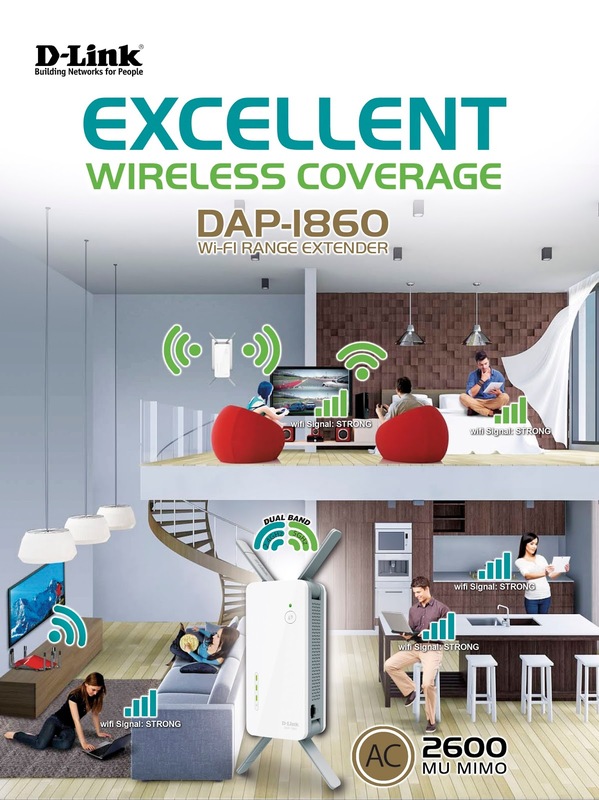 Because the DAP-1860 extends both Wireless N and Wireless AC signal from your wireless router, you can enjoy wider home wireless coverage with connection speeds of up to 2600 Mbps. Built with latest Wireless AC (wave II) with MU-MIMO technology, and is flexible and versatile enough as access point to let you add wireless connections to an existing wired network. To top it off, you and your whole family can watch movies or stream music and play video games as much as you like without any channel congestion due to the dual-band connectivity. With a stronger home connection, you can install wireless surveillance cameras, sensors, baby monitors, and alarms to beef up your security so that you’re prepared when it counts the most. Simply install the QRS Mobile app on your phone, and with the push of a button, the Wi-Fi Protected Setup (WPS) sets up the device in minutes, even without a computer. You won’t even need any additional power cables as the one-piece wall plug design is compact, portable, and sleek enough to set up anywhere in your home. Do you need help finding the optimal location for your extender in your office? The DAP-1860 AC2600 Wi-Fi Range Extender features D-Link’s Smart Signal LED technology, helping you gauge how strong or weak your connection is. The Smart Signal LEDs light up intuitively to give you instant visual feedback so you can test out multiple locations that work best. Who needs the pricier and more frustrating experience of installing professional Ethernet cables when the DAP-1860 can boost your signal strength for you? At just Php 8,380, you can expand your wireless horizons at home or in the office—no matter where you may be.